It looks like Microsoft has provided a fix for the IE Zero-Day Vulnerability. At approximately 10 a.m. PDT, we will release an out-of-band security update to address the issue affecting Internet Explorer (IE) that was first discussed in Security Advisory 2963983. This update is fully tested and ready for release for all affected versions of the browser. The majority of customers have automatic updates enabled and will not need to take any action because protections will be downloaded and installed automatically. If you’re unsure if you have automatic updates, or you haven’t enabled Automatic Update, now is the time. That includes those still running Windows XP SP3! The Microsoft Security Bulletin MS14-021 – Critical update shows affected versions of IE including Windows XP SP3 for IE6, IE7 and IE8 as being affected. So it certainly looks like Microsoft is including Windows XP in this fix which is great for so many XP users around the world! So if you are still running Windows XP SP3, please turn on your Automatic Updates and get back on the Internet long enough to snag the update. Yes, Microsoft has done an Out-of-Band Security Update for Security Update for Internet Explorer (2965111) which at this point still does not show the change. However as noted in theMicrosoft Security Bulletin MS14-021 – Critical does include Windows XP SP3 for IE6, IE7, and IE8. And since Microsoft only shows affected versions if they are affected AND will be included in the patch. Usually updates only include currently supported versions of Windows, so including Windows XP SP3 is certainly a welcome but unexpected inclusion. Thanks to Corrine at Security Garden for posting about this on her blog and on Scot’s Newsletter Forum. When I said that it was a wise move by Microsoft, I really mean that! 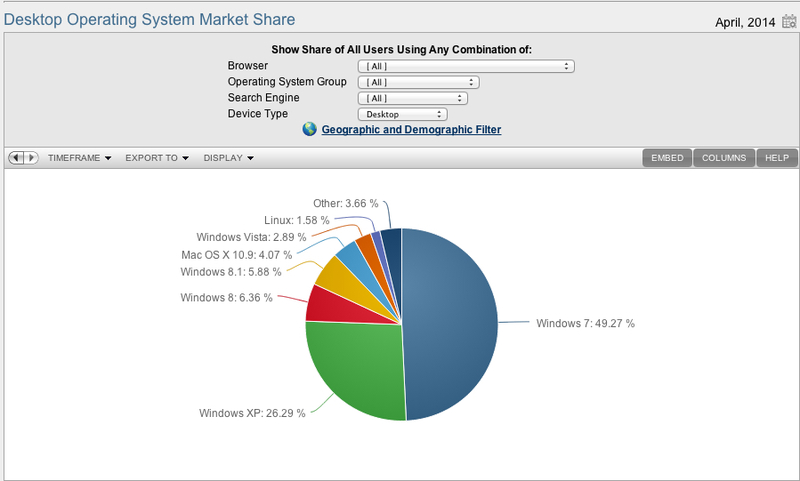 EDIT: Added the NetMarketShare.com info.